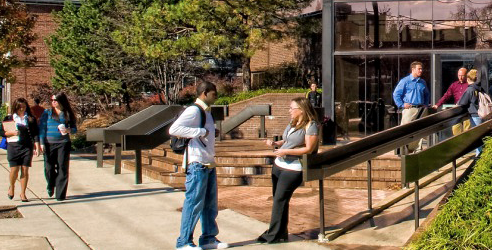 The Rutgers School of Business-Camden (RSBC) Internship Program provides with employers an opportunity to partner with Rutgers School of Business’ Camden’s students who want to apply their knowledge and skills in the workplace, expand professional skills, and earn money and/or academic credit for their work experience. Students are enrolled in an academic, credit-bearing online course with career-related and reflective assignments due throughout the semester. The course is designed to supplement the academic program by offering qualified students a “real world” employment opportunity to gain professional experience prior to graduation. The RSBC Internship Program provides businesses and local organizations with a pool of high achieving and capable student interns. Our students, who major in Accounting, Finance, Management, and Marketing are dedicated, diverse, and highly-talented. The course work aspect of the internship allows the Rutgers School of Business-Camden to track our students’ growth, obtain a better understanding of their strengths, reinforce accountability, and continuously improve the quality of our intern assignments at host organizations. The key to our success is the partnership with our internship hosts/employers. This partnership allows the host to be an integral part of the educational experience through mentoring, tutoring, and teaching. Course activities, such as the student’s research paper of the organization, the brief review of the intern’s performance requested of the employer, and the on-site visit coordinated by the intern where they demonstrate the tasks they have been working on and the skills they have learned, all lead to a comprehensive experiential learning environment and course. General internships are posted to the Rutgers-Camden Career Center’s RaptorLink Job & Internship Database. Employers who would like to post internships on RaptorLink can find posting instructions at http://cc.camden.rutgers.edu/employer_raptorlink. For specific business-related internship opportunities (Accounting, Finance, Management, Marketing, etc. ), we invite you to also submit your job description to us directly at experience-rsbc@camden.rutgers.edu for exclusive distribution to our Rutgers School of Business-Camden’s students or through our Internship Position Description Form. With the information submitted, the Internship Coordinator will contact you to confirm receipt and relay any questions about the position. Employers wishing to participate in the Rutgers School of Business-Camden Internship Program are asked to initiate this partnership by submitting a position description through our online Employer Position Description Form. Rutgers, the State University of New Jersey and the participating student appreciate the cooperation of businesses and organizations in providing internships for career exploration and development. Rutgers asks that the supervisor promptly notify Rutgers School of Business-Camden of any significant change to the status of the internship, including job duties and hours worked. Additionally, the supervisor is requested to contact Rutgers School of Business-Camden regarding any significant issue that would impact the student’s ability to complete the internship prior to terminating the position. Rutgers expects that the employer understands that internship sites will fully comply with applicable federal, state, and local laws relating to workplace safety and to discrimination in the workplace. The employer is committed to equal employment opportunity, affirmative action, and nondiscrimination on the basis of race, color, national origin, gender, marital status, religion, age, disability, and veteran status. This commitment includes equal opportunity and non-discrimination on the basis of sexual orientation and compliance with the Americans with Disabilities Act, which prohibits discrimination on the basis of disability in the workplace. Since the internship is for credit, the supervisor is expected to agree to complete the evaluation(s) required as part of the student’s course. Page last updated by School of Business at 12:40 pm October 3, 2018 . This page was printed from http://business.camden.rutgers.edu/internships/internshipdetails/ at 1:00 PM Thursday, April 25, 2019.